In the field of electronic wallets, it looks like Coin has a competitor. Wocket, from NXT-ID, can store up to 10,000 cards, including credit cards and store loyalty cards. The Wocket is smaller than the average wallet and powered by a single coin cell battery. Users just swipe their credit cards into the device to record them in the Wocket’s memory. Cards that use barcodes instead of magnetic strips – like loyalty cards and voter registration cards – can be scanned in as well. When the user wants to make a purchase or use a card, they choose a stored card from the device’s touch screen. Biometric data and a PIN allow access to the payment data. 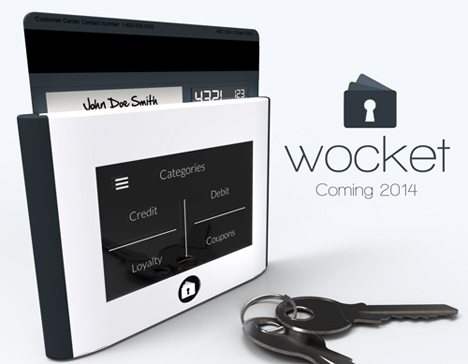 If the retailer’s payment system is authenticated by Wocket, the two devices communicate to complete the payment. No internet connection is required. But perhaps the most interesting feature of the Wocket is its programmable swipe card. At the point of sale, you can choose a payment option from your stored cards and program the included dynamic card to swipe in the retailer’s card reader. It holds only the exact amount of your purchase, and only until the purchase is complete. After that use, it goes back to a simple piece of plastic holding no personal or financial information. 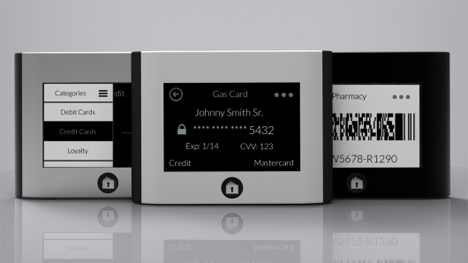 Unlike other similar digital payment systems, the Wocket doesn’t need to be paired with a smartphone or any other piece of technology – it’s fully self-contained. At the time of publication the retail price hasn’t yet been announced, but updates will be posted to Wocket’s website. See more in Futuristic or under Technology. April, 2014.